The truth and nothing but the truth. Elhanan Tennenbaum, the Israeli businessman who was kidnapped by Hizbullah in 2001, appeared before a court in Tel Aviv on Wednesday to explain the circumstances that led to his kidnapping. Upon his release from Hizbullah captivity in 2004 Tannenbaum requested the State grants him immunity from having to give details of dodgy business dealings that led to his kidnapping in Dubai by Hizbullah operatives, but the State turned down his request. Tennenbaum testified in the trial of two men accused of income tax fraud of which he is also a suspect. Tennenbaum told the court that he had left Israel using his passport and that he used a false identity abroad. 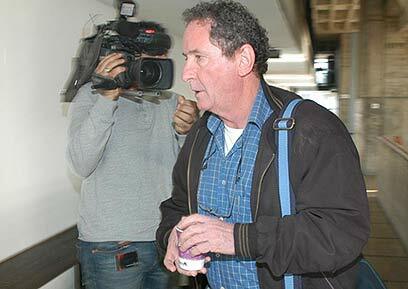 He was set to receive USD 200,000 for advising dealers on how best drugs could be smuggled into Israel undetected. He acknowledged that Qais Obeida, an Arab Israeli citizen living in Lebanon and wanted by Israel for connections with Hizbullah, had suggested he assist the smugglers with the plot. "I can tell people that if they import a washing machine to Israel, it is tax free and therefore they won't have to undergo massive checks by the income tax. That's an example of my capabilities. My job was to explain what the income tax regulations in Israel are," the retired colonel said. Tennenbaum refused to answer whether he was under the influence of drugs at anytime. He told the court that he left Israel on his own initiative and that upon his return he didn't confess the details of the drugs deal to interrogators. Tennenbaum signed a deal with the State Prosecutor whereby he is granted immunity from prosecution in return for disclosing all the details of the circumstances that led him to become a captive in the hands of Hizbullah. The State was concerned that Tannenbaum could have been enlisted as a spy for the Lebanese guerillas. Under the deal, which falls short of a plea bargain, Tennenbaum is required to undergo a lie-detector test to check the veracity of his claims and the State Prosecutor has the right to press charges against him should he fail the test. Tennenbaum said that upon his return to Israel part of a prisoner exchange deal between Israel and Hizbullah he was unaware that his deeds had prompted a stormy public debate in Israel. "I didn't know what was happening. I was in a different atmosphere. It was the first time I had seen living people in three years and a quarter, and when the state suggested the deal they heard all I had to say," he said. Tennenbaum said he was surprised by the State's offer because he thought he would be tried. "I didn't tell everything to interrogators, I didn't tell them about the drugs deal. I thought I'd be put on trial for using a false identity and for visiting an enemy state," he told the court. "I am not proud of my deeds. All that happened is a black stain in my past. Since I changed all my life and I am saying the whole truth, although this is not pleasant also for me," he added. See all talkbacks "Tennenbaum concealed drug deal from Shin Bet"